Emirates Critical Care Conference, is taking palce from 5th to 7th April 2018, Event Centre, Dubai Festival City, Dubai, UAE. Organized by the Dubai Health Authority – DHA and the International Pan Arab Critical Care Medicine Society – IPACCMS in collaboration with the Sheikh Hamdan Award for Medical Sciences – SHAMS. The International Fluid Academy (www.fluidacademy.org) in collaboration with the Abdominal Compartment Society (www.wsacs.org) organise a full day iFADmini and course on abdominal hypertension and abdominal compartment syndrome on April 5th, 2018. 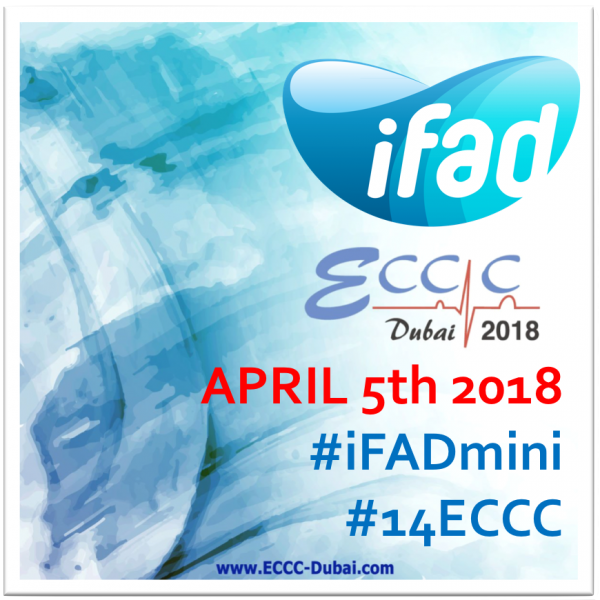 So, if you are going to the 14th ECCC (Emirates Critical Crae Congress) in Dubai join us for an iFADmini on April 5th in the Ajman Hall (Track 4). Use the official symplur hashtags #14ECCC, #iFADmini and #IFAD2018 to boost the numbers! Follow us on Twitter to hear the latest news on Abdominal pressure and Fluid Stewardship. The Faculty includes top speakers like Bruno Pereira, President of WSACS, Zsolt Bodnar, Secretary of WSACS, Manu Malbrain, Treasurer of WSACS and Chairman of IFAD, Xavier Monnet, member Executive board IFAD and Adrian Wong, member Executive Board IFAD.